The identification of external and internal issues of the organization (4 .1) along with determining the actions needed to address risks and opportunities with these issues (6.1) are two of the new requirements of ISO 9001:2 015. However, most organizations already perform these activities either formally or informally. This 30-minute event will discuss high level methods to avoid misinterpreting these requirements and how to use what you have. It will allow for a brief question-and-answer period focused on these requirements. This webcast will be presented by Lorri Hunt, who has participated as an international expert for the ISO 9001:2015 revision. 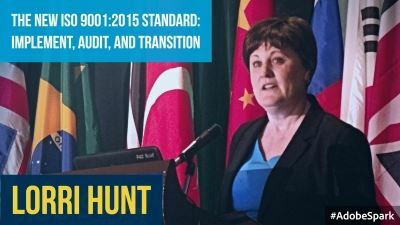 Ms. Hunt has been implementing Quality Management systems in diverse organizations such as Honeywell, the Department of Energy, and small businesses since 1994. She is an active member of the U. S. Technical Advisory Group to ISO Technical Committee 176. She currently serves as the head of delegation for ISO TC176/SC2. In this role, she is responsible for overseeing the development of consensus positions for the United States related to ISO 9001 and 9004. She is a United States expert and co-convener for the group responsible for ISO 9001:2015, TS9002, and The Small Enterprise Handbook for ISO 9001:2015. She also served as the international Deputy Task Group Leader to the ISO 9001:2008 Amendment.